So I have a new toy in the kitchen and I am sure you guys already know what it is since I have been singing praises about it quite regularly in my social media platforms. Yupe, it the Song-Cho irresistibly functional stove top Magic Quick Cook Pressure Cooker (6L) @ SGD278.50. When we talk about pressure cooker we always associate them with delicious, tasty soup that took shorter time to cook but yield the same taste as if we cooked them over the stove for hours. 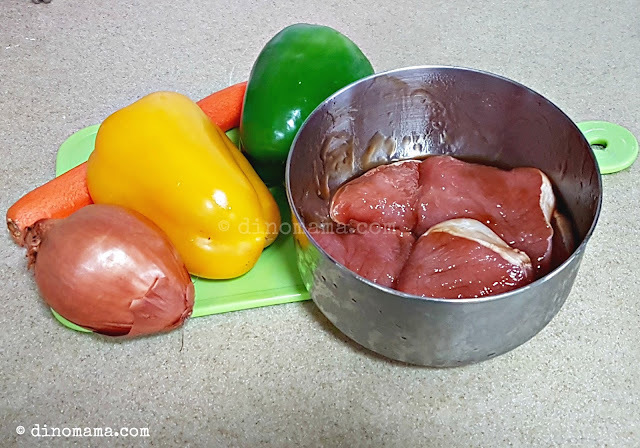 That day I decided to take it a step further and used it to prepare some boneless pork chops. 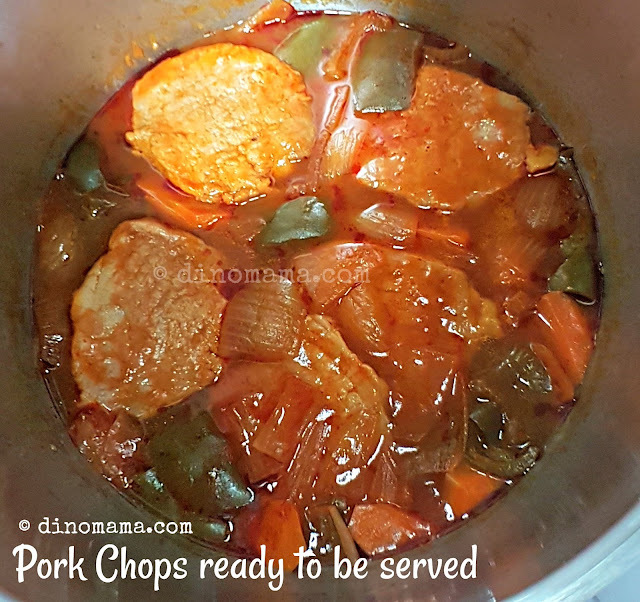 I remembered that morning when I told DinoPapa about preparing this dish with the pressure cooker, he replied "Okay" with a look of disbelief on his face but did not comment further. He knows better not to say too much lest he irks me and get an earful from me. Looking at the photo below you can see that it is a success, I mean, of course it's a success! I have much confident in myself! Now, before I share the recipe for that dish, let's talk about this Magic Cooker and why even DinoBoy love it so much. There are plenty of pressure cooker in the market to choose from and personally I think the following points are what makes Song-Cho Magic Quick Cook Pressure Cooker stands out from the rest. It is stated that this Magic Quick Cook Pressure Cooker saves up to 50% cooking time (working at 140kpa or kilopascal), as compared to other standard pressure cooker. 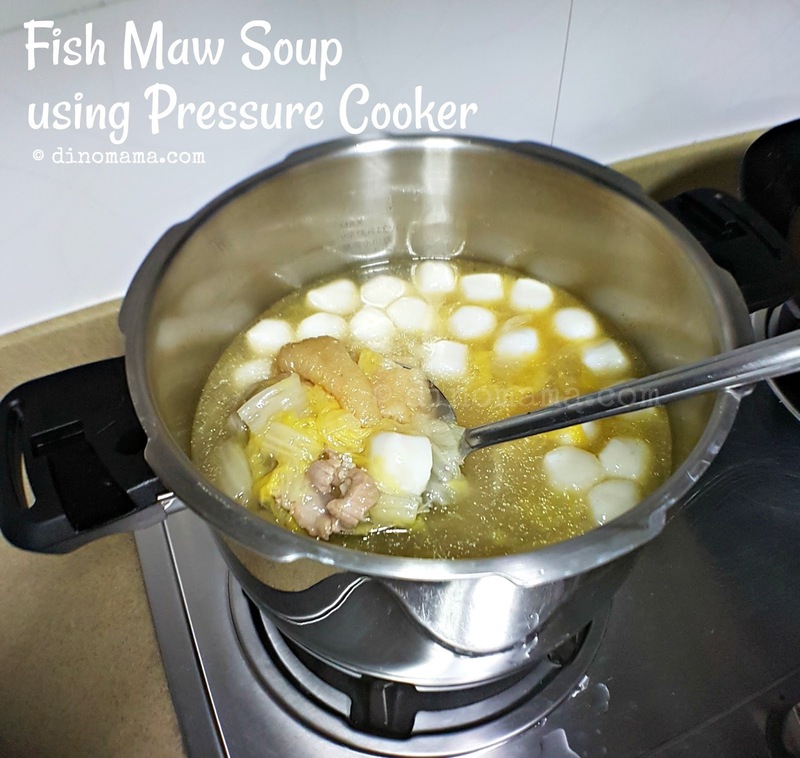 Since this is my first pressure cooker I have no way of verifying that, however I do know that my Lotus Root Soup, ABC Soup or even herbal soup are usually done in well under an hour. For a half pot of soup it takes roughly about 10 minutes for the balancing weight to start "dancing" (take a look at my short video to see the "dance"), turn down to the smallest fire to continue to cook for a few minute before turning off the fire and let the pot release the pressure silently. It takes about 20 minutes or so for the Pressure Indicator or Safety Valve to drop down thus allowing me to unlock the pot and serve the soup. 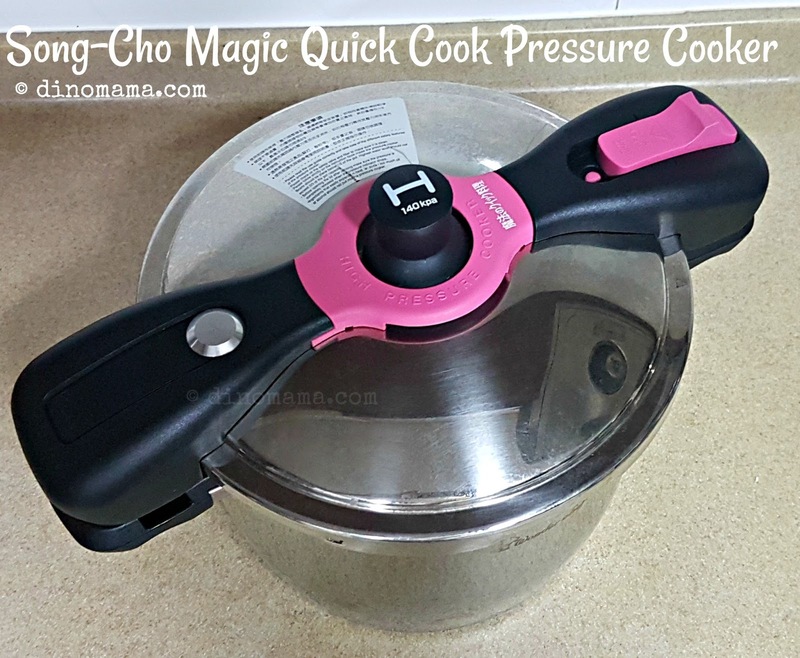 You might be asking how long should you continue to cook, well the rule of thumb for Song-Cho Magic Quick Cook Pressure Cooker is Usual Time Taken divide by 8. For example if I cook Lotus Root Soup in a normal pot over the stove it takes about 2 hours for it be ready so I take 120 minutes (in case you are wondering, 1 hour has 60 minutes so 2 hours there are 120 minutes) divide by 8, that will give us 15 minutes, the time required to continue boiling under small fire before turning it off. See! So easy! No more cooking soup the night before or only weekends! I can now make them on the day after I reached home from work, putting the soup to cook while I prepare the other dishes and we'll have flavourful soup to drink later. Pressure cooker relies on steam pressure in a sealed pot to cook the food, gone are the days where they are seen as pots rattling away on the stove threatening to blow a gasket or the whole pot (ok ok I exaggerated a bit), instead they are equipped with safety mechanism to ensure nothing gets blown up in your kitchen. Filter - New design with 8 side opening and one top opening to reduce the possibility of food getting stuck to the pressure regulator underneath. Pressure Indicator (with safety lock) - Raises once there is micro-pressure and prevent the pressure cooker from being opened. Safety Valve - Releases pressure automatically where needed. Second Safety Valve - Releases pressure automatically if the first one is not enough. The pot is made up of multiply stainless steel but that does not mean it weighs a ton, contradictory it is fairly light weight. With the multiple layers of stainless steel on the whole pot it provides high thermal conductivity outer layer for fast and even heat distribution which enables it to retain the food moisture and nutrition, that means we get to eat healthy food with most its good stuffs still inside them! Take a look at the photo below, it is not a dissected pressure cooker pot but it's Song-Cho's stainless steel pot but they are being manufactured with the same design. As you can see, Song-Cho's pot is multi-layered throughout the whole pot, even extended to the handle part. On the other hand, most of the other brand's stainless steel pot only have additional layers at the bottom of the pot. Besides being light weight, the Song-Cho Magic Quick Cook Pressure Cooker is easy to operate too, with its guided arrow you will know easily which direction to turn the cover and to release the valves etc for cleaning. Having said that, the pot handle design caters for both right and left handed users so the left handed users does not feel awkward when they try to lock the cover. Each pressure cooker comes with a stainless steel powder, trivet glass lid either for reheating or enabling us to use the pressure cooker as a normal cooking pot. The Song-Cho Magic Quick Cook Pressure Cooker can be used over the stove with fire, induction or electric cooker. 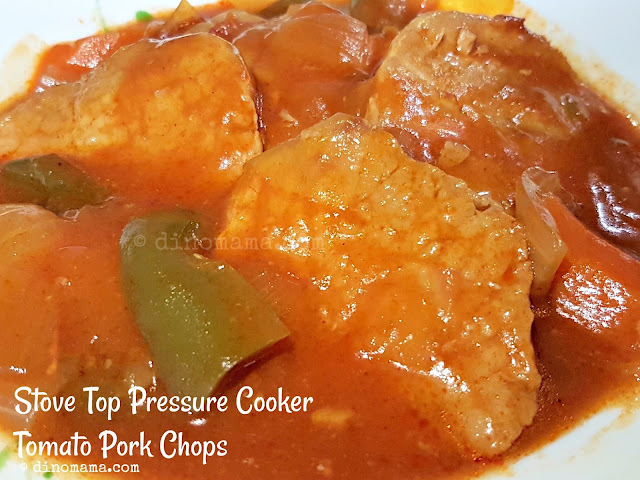 With its numerous plus points this is a pressure cooker that you will want to have in your kitchen because it will help you Save Time in cooking, Money for using lesser gas or electricity. Back to the Tomato Pork Chop that you see at the top of this post. We love this dish but the hassle of cooking the meat and the vegetable separately is time consuming, not to mention a few more plates to wash after that. On top of that there is a risk of over cooking the meat thus making it too tough to bite or chew. With the Song-Cho Magic Quick Cook Pressure Cooker, the meat is browned in the pot and vegetable with tomato sauce dunked in after that, cover and cook. All's done in 20mins! As for the vegetables for this dish, you can basically use any that you like though those its better to add in root vegetables like carrots, turnips, radish, potato, onion, celery since they hold up well during long simmering or in this case pressure cooking. I added in capsicum and they turned out soft and bit soggy which we like. So it all depends on your preference. For others like broccoli or cauliflower are best added in later when the Pressure Indicator or Safety Valve has dropped down and able to unlock the pot. For the tomato sauce and water, you can add in more or less from what I have indicated, based on your preference on the sweet sourish taste and the consistency of the sauce. Basically this is a One Pot Dish so you adjust the flavour and add in the ingredients you like and have it alone with steaming white rice or with other dishes. Enjoy your cooking! 1. Slice the pork loin into about 1.5cm thick. Use a meat tenderlizer or the back of a knife to gently chop the pork loins on both sides to tenderize it. 2. Marinate the pork loin with Oyster sauce for at least 6 hours. Remove at leave 15mins before the time you intend to cook it. 3.Roughly chop up the potato, capsicum, onion and carrot. Set aside. 4. Heat up the pressure cooker and pour some olive oil into it. 5. Add in the pork chop and brown both sides. Discard any excess oil if any. 6. Add in all the vegetables into the pot. 7. Mix the tomato sauce to about half cup water to 1 cup tomato sauce or to the consistency you prefer. Add the mixture into the pot and give it a little swirl. 8. Cover the pressure cooker and lock the lid. Turn on the fire to cook it till the Balancing Weight starts to shake. 9. Turn down to smallest fire, let it cook for another 2 to 3 minutes and turn off the fire. 10. Remove the pressure cooker from the stove and let it cool down till the Safety Valve drops down. 11. Serve and enjoy the pork chops! If you love Fish Maw Soup you will know the many hours we have to let the pot of water simmer to soften the cabbage and the fish maw, at the same time ensuring that the cabbage does not dissolve before the fish maw are soft enough OR that the fish maw gets too soggy because we lost track of time and left it to simmer for too long. 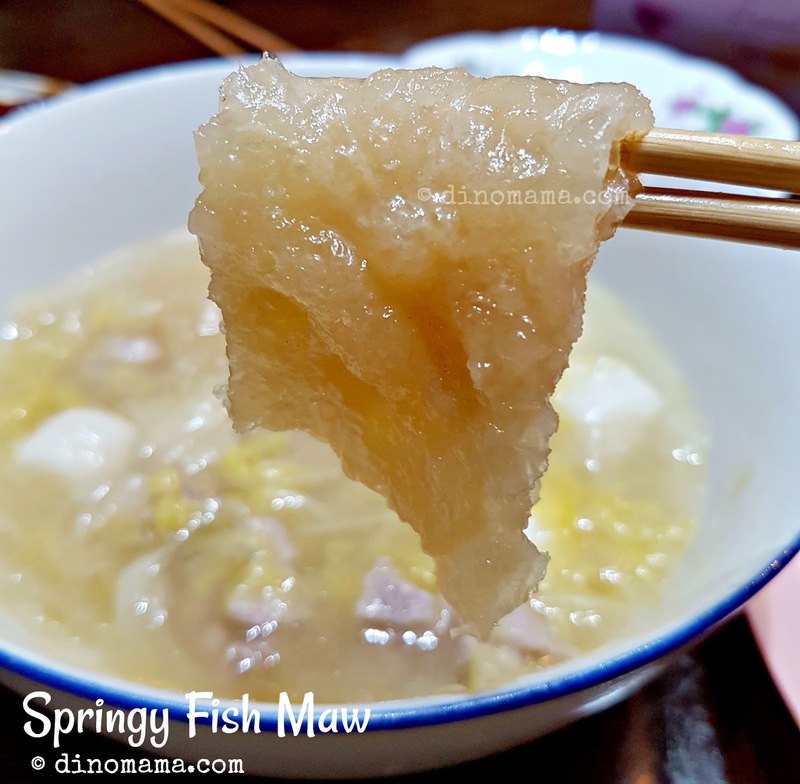 Well, look at my perfectly cooked Fish Maw Soup~ Cabbage soft and sweet, fish maw springy and spongy. The soup's all done within an hour! 'Nuff said! I am part of a group of mummies who had the chance to use Song-Cho's kitchen appliances, read their individual review on different products too. Disclaimer : We received a 6L Magic Quick Cook Pressure Cooker from Song-Cho for the purpose of this product review post. No other compensation were received. All photos in this post belongs to The DinoFamily, you may not use them with out our permission. All opinion in this post are 100% ours based on our user experience on the product.